Texas Drivers Ed Online - Parent Taught Driver Education $75! In Texas the parents of new teen drivers have the option to teach them how to drive instead of having them take a traditional drivers ed program. This often allows the parents to be more comfortable with the new drivers abilities before going out on the road alone. Many parents we talk with say that teaching their teen to drive made things easier for both themselves and their child. With the parent teaching, the new driver is able to learn with an instructor they already know and the parent is able to relax knowing that their teen is ready for the road. It really is a win-win! Studies have shown that people learn better and have higher memory retention when they are given information in an environment which is comfortable and familiar to them. For teens between the ages of 14 and 17, this happy place is often online. This course was designed with them in mind. To target teens even more effectively, the course can also be taken from a downloadable app, giving students the flexibility to complete the course on the go. While getting behind generates a great deal of excitement, it also carries with it a great deal of responsibility. As soon as a car is in gear, the driver is instantly in control of something that can easily become very dangerous. Learning the driving information and tips covered in this course will serve as an invaluable asset as your teen sets out on the road for the first time. There is no easy way to say it, learning and teaching to drive can be a challenge. not to worry. We have partnered with Aceable.com, the newest and most innovative teen drivers ed provider in the nation. They understand that drivers ed isn't something you do every day, so they are there for you every step of the way. If you find yourself stuck with a question or concern, they are available to lend a hand from 8AM to 9PM any day of the year. Ready to get going? Just click "Register Now" and follow the prompts directly into your online course. Everything is set up to lead you through the process (including necessary forms and practice driving hints) from start to finish. You'll have your teen headed toward their permit in no time with our fast, fun and convenient course. Starting out as a new driver is an exciting time but can also be confusing. Here are the steps you need to take to get on the road. Register to take the course online. Follow the link to the DPS required documents and parent packet. Finish the first six hours of class. We'll send a certificate of completion that will take the place of your written test at the DPS office. Complete the required documents and head to the DPS to get your permit so you can start driving. Practice, practice, practice with your folks and log the required 44 hours of driving. Head back to the DPS office for your driving test. Congratulations, you are now Texas's newest licensed driver! 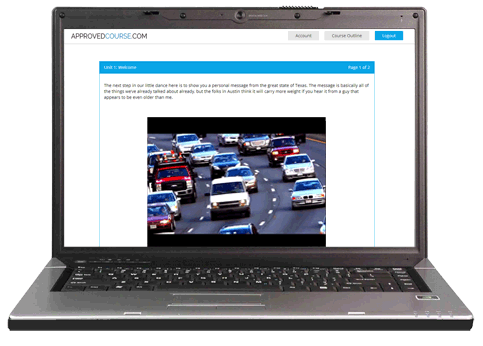 Texas Online Drivers Ed Made Easy! Get started today and you will be behind the wheel before you know it!